This is WMAC ’s premier site, catering for all outdoor model classes except slope soaring. It is held by arrangement with the New Zealand Army. The Army currently uses it only for occasional demolition exercises and occasional training exercises involving both live and non-live firing, but the National Rifle Association and Wellington Rifle Association use it regularly for weekend shooting. Consequently, several of the rules and operating procedures that follow have been written to meet these other users specific safety and security concerns. These are printed in bold this colour type. Failure to observe them to the letter could lead, among other things, to our no longer having access to Seddon Range. At the very least, any such failure will be treated as a breach of Club discipline and dealt with accordingly. No modeller or group of modellers may use Seddon Range without having first collected the key to the gate and radio from the Trentham Camp Guardhouse. Pilots must hold an appropriate MFNZ wings qualification or be under direct supervision of an appropriate wings qualification holder. The last member to leave Seddon Range must put everything away, lock the clubhouse, turn on the electric fence, lock the gate at the entrance and return the key and radio to the Trentham Camp Guardhouse. Entry to the Range is absolutely forbidden when demolition exercises are taking place. Shooters shall always have first priority in Range use. No one may retrieve a downed model from an active shooting template without the express permission of the officer in charge. No one may enter Rimutaka Prison grounds to retrieve a downed model without first telephoning Corrections on the phone number posted in the clubhouse. Over flying the security fenced area of Rimutaka Prison is strictly forbidden. No model shall be flown over an active firing line and all models must be kept at least 200 yards away from an active firing line. The gate at the entrance to Seddon Range must be kept closed at all times when there are livestock on the range. Vehicles must not be driven or parked on the rifle range mounds. They must be parked only in the areas designated. (These may vary from time to time, depending on flying activities and weather/ground conditions. 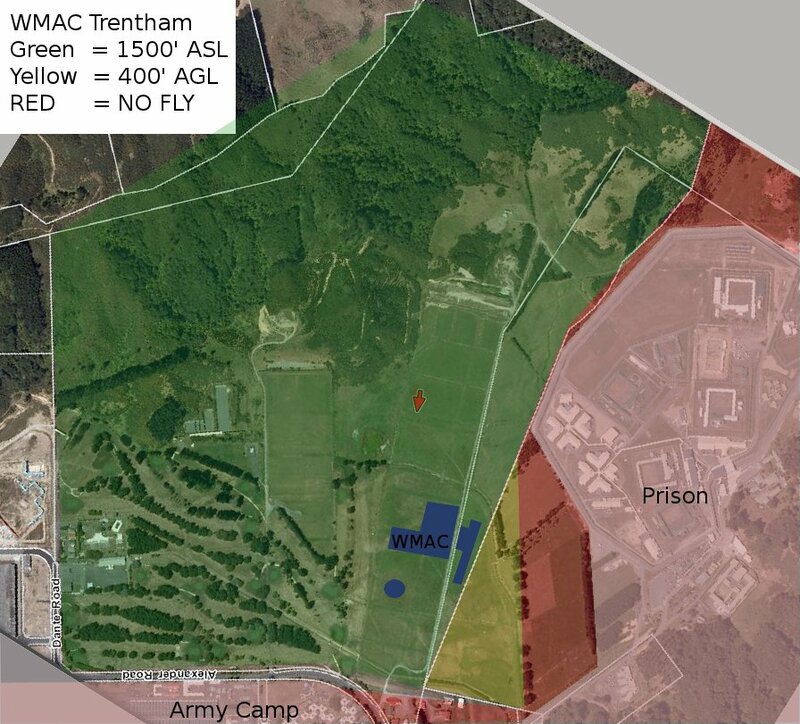 Only financial members of WMAC, their guests, and financial members of other clubs affiliated to Model Flying New Zealand (MFNZ) may fly at the Trentham site. Proof of Club membership must be produced, when requested by Army personnel, or by a WMAC member. Visiting fliers wishing to fly unsupervised must produce a Wings badge or proficiency certificate on request. All new fliers are expected to become financial members of WMAC after no more than three visits flying at the site. All fliers, regardless of flying discipline, must be prepared to accept direction from the Club Captain or any Committee Member when it is felt that some action is required for the benefit of the majority. Any flier aggrieved by such action should make a written submission to the Committee within 7 days. When different model classes cannot be operated concurrently with safety, the fliers concerned shall negotiate agreed periods during which each flying activity will have exclusive use of the relevant flying area(s). No engines shall be started before 9.00am. Engines 0.10 cu in and larger must never be used without an effective muffler. Any type of model may be flown anywhere on the rifle range area when a WMAC member is the sole occupant. When more than one person is flying the rules set out in 2.2, 2.3, 2.4 and 3 (below) shall apply. Other arrangements for simultaneous flying, however, may be made by negotiation between the fliers concerned. Where there are conflicting demands, officially scheduled contest activities shall have priority access to airspace and facilities, the latter including radio control (R/C) frequencies. Take off and landing shall be in only one direction. That direction shall be agreed amongst the fliers at the site and may need to be varied from time to time if the wind direction changes. Before moving out to the strip fliers must carefully check to ensure that no models are approaching. All fliers shall stand in the designated pilots’ areas, adjacent to the mown taxiway from the pits to the strip. Each must be within clear hearing distance of the others, i.e. not more than about 2 metres apart. No more than six power models shall be in the air at any time. Low “beat ups” over the runway while other models are in the air are forbidden. Free Flight models should not be launched from positions where they are likely to land in the R/C power-flying, car parking areas or the grounds of Rimutaka Prison. R/C Glider, R/C Vintage and R/C Electric model launching and landing areas shall be located in the immediate vicinity of the 600 yd shooting mound and in such positions that there is no possibility of any vehicle in the parking area(s) being hit by a model, should there be a loss of control at launch. Hovering activities shall be restricted to the mown pads. Within this area hovering activities shall be kept at least 25 m downwind of the areas where cars are parked. the Seddon Range area allocated to Fixed Wing Free Flight, R/C Glider, R/C Vintage and R/C Electric Model flying. Where fixed wing and helicopter flying activities cannot safely take place concurrently, the procedure specified in clause 1.13 above shall be followed, the time allocations being those set out in 3(d) below. If not using a modern frequency hopping 2.4GHz RC system, you must correctly use the official MFNZ radio control frequency pegboard system. Use of Synthesized Frequency Transmitters (non-2.4GHz). You must have a separate transmitter flag, marked with the channel for every frequency that you are prepared to use when you change frequencies. You must take extra care when using the frequency control system. Frequency pegs are not to be removed from site. a period agreed between them. Any R/C flier causing a shoot down is personally responsible for fully compensating the owner of the affected model. Any R/C flier out of practice must enlist the assistance of an experienced flier until renewed competence is demonstrated. Those fliers who have not passed the MFNZ Wings Badge test shall have their new R/C models, and those that have been repaired after a crash, checked by an experienced flier/builder before they are flown.